The Marche is a small region in central Italy. Marche is not as famous as the neighbouring Tuscany, or as the touristic seaside of riviera Romagnola at its north. However, its beaches, its blooming countryside and its artistic heritage are at least as good as the ones showed off by other Italian regions. Not to speak about the energy and hospitality of its inhabitants. The last week of May 2016, ARS4Progress had the pleasure to visit five different towns and, in total, 264 Italian youngsters enrolled in the Regional Civil Service. The young attendants (18-29 years old) perfectly mirrored the reality of the region they live in. They are aware of Marche’s beautiful panoramas, its spectacular cultural heritage but, somehow, they also feel compressed by the bureaucracy and by the not-so-easily accessible local authorities. At least, this is what I perceived from the Italian series of Study Groups, which has been a special one, indeed. Firstly, because of the number of participants. Thanks to ARS Marche and GIOCOM, we joined an already ongoing Civil Service program which allowed us to meet an average of 53 youngsters per Study Group Session, in four different cities (Macerata, Fermo, Ripatransone, Ancona). Secondly, this was the very first Study Group in the framework of the YouthMetre project. Thus, it represented a test for the non-formal education activities and talks we had planned for the participants. Even if such a large number of people was not ideal for round table discussions, the participants engaged in fruitful debates, and the planned activities proved to be a powerful means to stimulate reflections and ideas among them. The enthusiasm of participants to engage in debates, as their desire to express their needs and opinions, stunned me. I felt that the SG’s attendants had a real need to speak up about their expectations, while being hungry for information on how to advocate their ideas to decision-makers, and for tools to improve the situation in their Region. In Macerata we had the pleasure to meet 72 young people with whom we discussed the EU Youth Strategy’s key area of Employment and Entrepreneurship. Dialogue aroused to propose ideas of potential good practices to ameliorate the employment situation of the Marche. During the Study Group’s break I had the chance to talk with some girls who had graduated in Arts. They were willing to give a new life to Marche’s cultural and artistic heritage. However, they considered their dream as hardly achievable because of the scarcity of funds, the complex bureaucracy, and the lack of political support to their ideas. This issue was then discussed in-depth during the second Study Group in Fermo, a tiny lovely city on the top of the Sabulo hill. There, a group of participants stood up expressing their ideas to improve the cultural heritage of their city. I was impressed by the passionate way they talked about the treasures hidden in almost all Italian towns. I have to admit that their reflections particularly touched me since I am Italian too. I am proud of the artistic and natural beauty of Bel parse. However, I cannot say to be as proud of how we are managing it today. Fermo’s youth proved to me that, notwithstanding their obstacles, there are numerous youngsters who have not quit the struggle, nor they are disillusioned. On the contrary, they are willing to engage and work hard in order to develop better plans for Italian cultural heritage. In so doing, they also wish to create new working opportunities for themselves and for other youngsters. 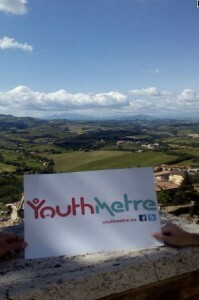 The YouthMetre has precisely the objective to support them, by providing information, data and tools to advocate local decision-makers, develop a knowledge on the opportunities put forward by the European Union and, finally, to put European youngsters in relation. 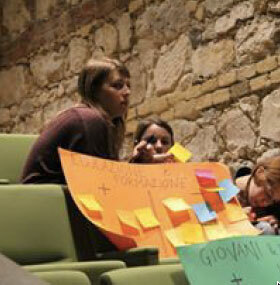 The third Study Group, held in the town hall of Ripatransone (Ascoli Piceno) focused on the necessity to provide a quality education since primary school. Then, participants focused on how to boost the positive peculiarities that their territory already offers. Finally, in Ancona, a beautiful seaport on the Adriatic Sea, we had the opportunity to entertain two Study Groups, meeting 100 youngsters approximately. During the Training sessions we touched several topics, which are hard to resume in few lines here. They went from the Italian situation in the Health and Well-being sector, to ideas and good practices to ameliorate Social Inclusion. The debates and the YouthMetre’s activities organized with these two Study Groups, held in Conero Park of Ancona, concluded our week of Study Groups and interesting meetings in Italy. While discussing with young Italians in Ancona, I came up with a wish. Some youngsters living in Ancona were explaining to me the etymology of their city’s name, Ancona, which comes from the Greek word Ἀγκών: elbow. This is because the promontory upon which Ancona has been built has the shape of an elbow. The elbow shape of Ancona not only made this maritime city a strategic seaport for business or military reasons, but it also became a crucial area for exchange of cultures and traditions among the Medirranean. I wish that YouthMetre too will manage to inspire young European citizens by building a network of youth organization that generates an exchange of ideas and experiences. I wish that it will develop into a tool that empowers youth with information, becoming a “strategic port” for communications and exchanges among European youth. And I am pretty sure that with engaged and motivated people as the Italian ones, this will be realizible indeed.